Larry “Drums” Brancaccio and Bammer Racing is ready to go racing but one of their winter projects involved a full photo shoot and after press time, you can find Drums in Issue 2 of Hot Rods and Harleys Magazine. page 52-57. Publisher, Paul Kenworthy and associate editor Maria Hinchcliff did a great job with not only the images they used but they seemed to capture the essence of Drums–wide open nitro wild man. You can find Hot Rods and Harleys at Barnes and Nobles Book Stores throughout the US. 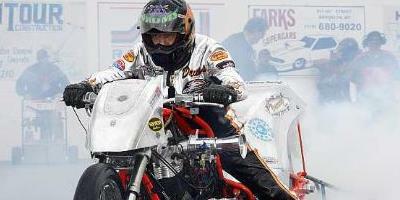 Bammer Racing will next race at NHRA -Harley-Davidson Drag Racing Series “The Mickey Mart Rewards Cavalcade of Stars presented by Budweiser” at Summit Racing Equipment Motorsports Park, Norwalk, Oh, May 17th-19th. Crew chief, Michael Hopkins has Drums’ bike ready but there might be a few changes as Brancaccio has been trying out some other seats. Stay tuned.